What is the USL Championship? Entering its ninth season, the USL Championship is the second division of American soccer, directly below Major League Soccer. The USL and MLS entered a mutually beneficial partnership in 2013 to grow the sport domestically. How many teams are in the USL Championship? The Swope Park Rangers are one of 36 clubs, making the USL Championship one of the largest professional soccer leagues in the world. Thirty-six teams are playing in the USL Championship in 2019 in markets across the United States and Canada. What other MLS teams operate USL Championship clubs? In addition, Rio Grande Valley FC (Houston Dynamo) and Reno 1868 FC (San Jose Earthquakes) are owned by independent groups while the technical staff and players are chosen by respective MLS clubs. When is the USL Championship season? The 34-game regular season is being conducted over 33 weeks, which will kick off on March 8th and will conclude on October 20th. The team with the best record across both conferences will earn the regular season title and home field advantage throughout the postseason. Why did Sporting Club start a USL Championship team? The Rangers are closely integrated within Sporting Club’s short-term and long-term strategic goals, providing a pathway to the professional level for players in the Sporting KC Academy and a proving ground for players on loan from Sporting KC. Who is our head coach? Where do the Swope Park Rangers play? Swope Park Rangers home matches are held at state-of-the-art Children's Mercy Park in Kansas City, Kansas. Free parking is available for all home SPR matches in the Red Lot and seating is available in the East Stand. How can I secure tickets? Single-game tickets can be purchased via the club's SeatGeek page. Season and group-ticket packages are available by calling 888-4KC-GOAL. 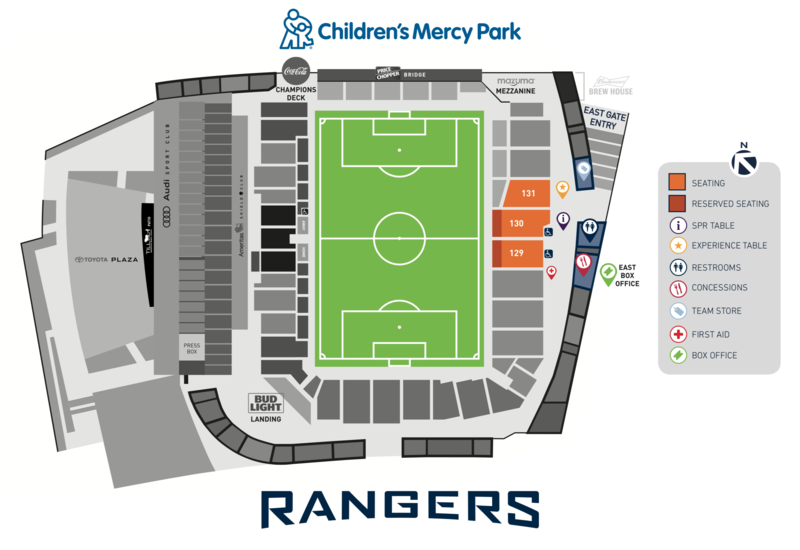 Visit SportingKC.com/Rangers/Tickets for more information. How can I follow the team online? Visit SportingKC.com/Rangers for all the latest news and information about the Swope Park Rangers. In addition, fans can follow SPR on Twitter, Facebook and Instagram. Where can I watch USL Championship games? Through a partnership with ESPN, all USL Championship matches in 2019 will be streamed live and in HD on the ESPN+. Can I buy Swope Park Rangers merchandise? SportingStyle carries Swope Park Rangers merchandise for men, women and youth. The full SPR collection is available at Swope Park Rangers home games at Children’s Mercy Park. Are there internship opportunities with the Swope Park Rangers? Yes. Sporting Club will be offering internship opportunities for select front office positions (e.g. Public Relations, Ticketing, Marketing) and will post openings on TeamworkOnline.com. Are there be sponsorship opportunities for local companies? Yes. Ivy Investments was announced as the club’s presenting jersey partner and additional sponsorship opportunities are available. Please contact Justin Compton via phone (913-387-3425) or email (jcompton@sportingkc.com) for more information.